With all the getup I have, I better produce something worthy at The Huntington! I am working on some studies from the statues in the North Vista. They are not the highest quality statues in the gardens but they are creative and establish a certain ambiance. About the place my art is at right now, as I shake off a certain rustiness and pick up where I left off many years ago. My plan is to use these studies in combination with appropriate plants, to produce some woodcuts. The hope is that woodcuts will force a certain boldness and even some spontaneity in the work. The struggle is always between what I see and what I feel. I was particularly exasperated when suddenly I heard the sound of children’s voices. Into the North Vista trouped a group of children, somewhere between eight and ten years old, along with two instructors. I smiled at a couple of them and was immediately surrounded. They were holding journals, so naturally I asked to see a few and we shared art work. It is always so refreshing to be around children, and their natural enthusiasm is contagious. They noticed what I was drawing, which led them to discover the head of Medusa, and they were the ones who informed me it must be Perseus whom I was drawing. One boy in particular rattled off the names of many of the other Greek gods featured in the gardens, and told me which constellations are currently visible. It was a welcome break and lifted my spirits greatly. Meanwhile, photographer Sadja Herzog was at the other end of the North Vista taking pictures of hummingbirds. He noticed the activity and gets credit for the photo above, which effectively captures the moment. Sadja is the first artist I have had the pleasure of meeting at The Huntington. I also met a wasp, which I thought was a beetle when it landed on the bridge of my nose! That was a first since I was a child myself and made the mistake of going outside with peanut butter and jelly on my lips. What a refreshing way for you to have an interaction with school-aged children. 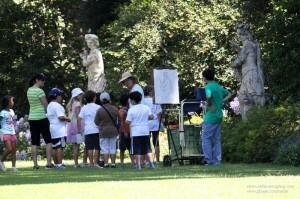 It sounds like they were able to impart a bit of knowledge to you in regards to the Greek statues in the park. And you also got a lesson on the current constellations. I don’t think that would have happened at Lindbergh. Can’t wait for you to have your first exhibit!